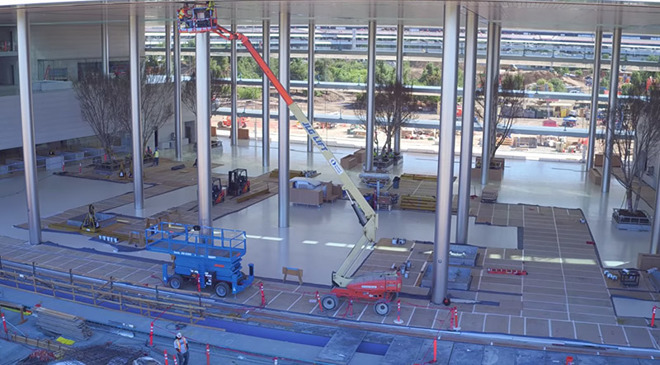 Drone pilot and videographer Duncan Sinfield is back with a new Apple Park progress video, this time taking a closer look inside main structure's caf, as well as views of traffic driving in and out of the facility. Sinfield's latest video, posted to YouTube on Thursday, reveals little in the way of new additions to Apple's new Cupertino, Calif., campus, though there have been a few developments since his last update two weeks ago. Most notably, work on the main "spaceship" building's interior has commenced, with the central caf now sporting a handful of large planters containing what appears to be local trees. The exact species is unknown as the plants have yet to grow leaves. Apple co-founder Steve Jobs sought to fill Apple Park with some 9,000 trees indigenous to the area, especially fruit varietals he remembered from his childhood. Elsewhere on campus, landscaping operations are winding down as contractors prepare to put the finishing touches on purpose-built berms and other artificial terrain designed to block views of the busy interstate that flanks Apple Park. In another clip, cars can be seen flowing into and out of the twin parking structures located on Apple Park Way. In the background is the mostly finished R&D building, which already housed a number of employees. Earlier this month, Wired toured Apple Park with company executives. The feature explored the process behind imagining, designing and executing a multi-billion dollar campus, with input from company executives and longtime collaborator, architect Norman Foster. Apple Park is in large part the brainchild of Jobs. The tech guru envision the campus as a sanctuary of sorts. For example, a two-story yoga room in Apple Park's fitness center is covered in stone sourced from a quarry in Kansas then distressed to mirror Jobs' favorite hotel in Yosemite. Last week, Apple updated its Maps app to include detailed 3D models of Apple Park buildings, roads running into and out of the campus, pedestrian walkways and more.